Feather Raid is an excellent shooter featuring a power-up system much like the one employed by Konami's Gradius series. 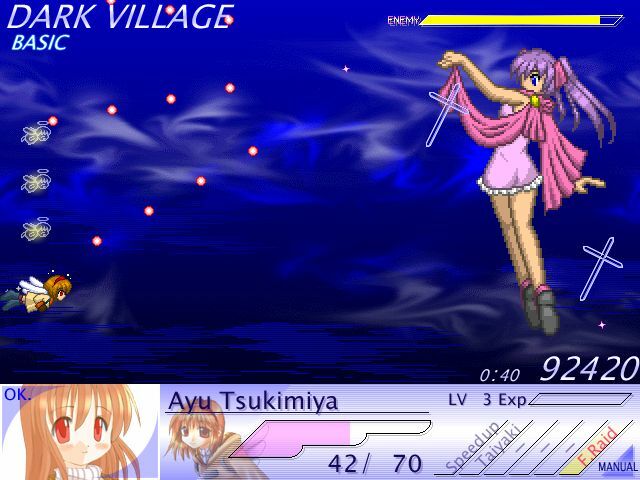 There are no lives but your character is able to take several hits, indicated by the HP gauge shown at the bottom of the screen. Your HP can be increased by completing levels and gaining experience points. Hold down the Z key to shoot and press the X key to activate a power-up. Tap the left shift to launch the cyclone attack, although it requires a recharge after each use. Refer to the FAQ on the left sidebar for instructions on navigating the Vector site.